The VE Commodore is an enormous car. Huge. Gargantuan. When the VT Commodore was released, we said that there was room for a small person to sit on the floor behind the driver’s seat. Now, with the front seats positioned for normally sized people, you could have a bloody party in the back. In fact, unless the VE is designed for extremely tall, fat people, we can see no reason why the car is so enormous. Doesn’t matter? Well perhaps less so in the run-of-the-mill models, but in the SS V – a car with seriously sporting pretensions – we’re talking about lugging that extra mass when you want to accelerate, want to brake or want to go around corners. But clearly Holden believe there’s a market for people who don’t care about size - and care little about fuel economy. And if you’re one of these people, let’s be absolutely clear: the SS V is a brilliant car. Over the more downmarket SS, the SS V scores projector headlights, 19 inch wheels, a colour central LCD, curtain airbags and a few other good bits. In as-tested 6-speed auto form it comes in at AUD$53,990 - an amount which is simply astonishingly good value for money. Include sat nav on the standard colour LCD (and nav is a relatively cheap option), glue on a Euro badge, and in nearly every aspect the Commodore could be a $100,000 car. Remember, this car is now sophisticated from top to toe, from suspension to chassis control electronics to braking to interior to performance. And yet it also has the ruggedness that cannot be denied of the local product, is supported by one of the best service networks in the country and – arguably – looks very impressive. For us the most remarkable aspect of the car is its poise on the road. The steering – controlled by a wheel with a rim too thick for all but large hands – is superbly weighted, has excellent on-centre feel and a directness that is a good compromise between sports twitchiness and lethargic limousine. The suspension is extremely well sorted, with linear body roll (and not much of it) and a beautifully engineered match with the stability control system. Basically, the SS V is a safe and reassuring machine to point and squirt, lair-arsing in the bellow of the V8 - or to use as a weapon to analytically and quickly despatch a difficult stretch of mountain road. And the engine, the 6-litre Gen 4 pushrod V8? Well, the paper specs suggest that with 270kW and 530Nm it’s big and it’s powerful – and that’s exactly how it feels! In fact, it’s pretty hard to tell you anything that “6 litre V8” doesn’t. When heard from outside the car, the exhaust has a superb note (inside, it can at times drone a little, eg when climbing country road hills) and when given throttle, the V8 responds well. Idle is lumpy. Sometimes – like when the engine has just been started and the air con is on – the idle is very lumpy indeed. 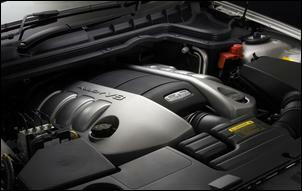 Like the previous 5.7 litre V8, the engine is tuned to rev – it doesn’t have gutfuls of bottom-end torque. But then again, there’s a 6-speed auto to pick the right gear - so the torque at 2000 rpm isn’t as important. 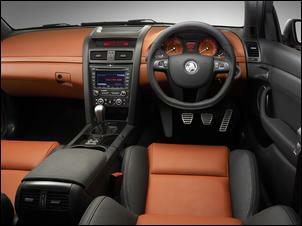 The auto – controlled manually only by the gear-lever not steering wheel buttons – works well most of the time. But not all the time. Twice in the time we had the test car the auto has spasms – once it stayed in manually-selected low gear even when the lever was returned to Drive, and the other time it took a long time (perhaps a few seconds) before responding to a large throttle kick-down. However, in normal driving, it makes the performance of the big V8 immediately accessible. Playing through city traffic, the auto is quick – very quick. Against the stopwatch we recorded a 0-100 km/h time in the low sixes. And what of the fuel economy? If it’s anything which makes this car seem so out of step with prevailing social values it’s the huge engine. With the present state of technology it would seem impossible to make miserly a 6 litre V8 that’s lugging around 1805kg – and so it proves. Unusual circumstances for our test meant that we weren’t able to have the car as long as normal, and that most of the kilometres were on gently driven 100 km/h roads. We’d therefore suggest that the 12.5 litres/100km figure we achieved represents the best that any driver would ever see with the car being driven normally. And the maximum fuel consumption? Drive the car hard and it’s easy to be in the low twenties. So how does the interior of the SS V stack up? Very well! Room is huge, the seats comfortable (although oddly the fronts don’t have adjustable B pillar seatbelt mounts) and the interior pockets and compartments well organised and practical. The boot is probably amongst the biggest of any sedan sold, although the rear seat does not fold flat – a large ski port is provided instead. The other side of this folded part of the seat contains a picnic style tray and holders for cups. A red warning appears on the locking tab if this part of the seat has not been returned fully home – good design. The boot opening is fine (in most current cars it’s quite restricted) and external hinges and gas struts help maximise the opening. Under the mat (in the test car a practical rubberised insert was also provided to cover the carpet) you’ll find an 80 km/h rated space-saver spare. A full size spare is available. The displays – a large colour LCD in the centre of the dash and a smaller red/black LCD in the centre of the instrument cluster – work well and the associated controls are clear and after a short familiarisation, easy to use. Interestingly, the huge, ugly and unwieldy buttons of Commodores of the last decade are gone – the controls use clear and crisp graphics and normal sizes. But driver vision is hampered by large A-pillars and we found the external rear vision mirrors a little small – or perhaps we’ve got used to heavily concave glass all round. The rear spoiler also obscures a lot of the rear vision. The body looks well made and the paint on the test car was lustrous (except under the boot lid, where it was poor). Shut a front door with the windows down and there’s an awful, cheap clang. The rear windows also don’t fully descend. As you might have gathered, in this test we’ve wrestled with the final judgement. One part of us says that the SS V is simply a great car; in fact, in terms of value for money, an amazingly good machine. Safe, fast, roomy, practical, well designed, fun – a gun performance car. But another part of us says that the SS V is a dinosaur anachronism, a car where bigger is equated to being always better, and where if driven as designed, the consumption of fuel, brake pads and tyres will be huge. If only Holden had put the same design team onto something scaled at 75 per cent... 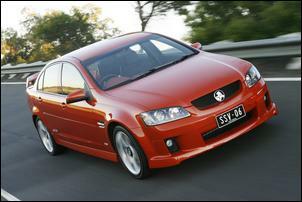 But they didn’t – and this test is of the VE Commodore SS V we actually get. In the final analysis, the Commodore dramatically raises the bar for Australian sporting sedans, and at this price, can easily be argued to do the same in a worldwide context. We absolutely loved driving it for the test period. But would we buy one? Hell no! 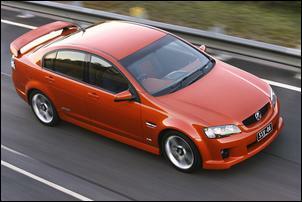 The Commodore SS V was provided for this test by Holden Australia.